Tape media management, media costs, 3rd party offsite contracts and the sheer volume of data growth makes tape backup challenging in any organization. 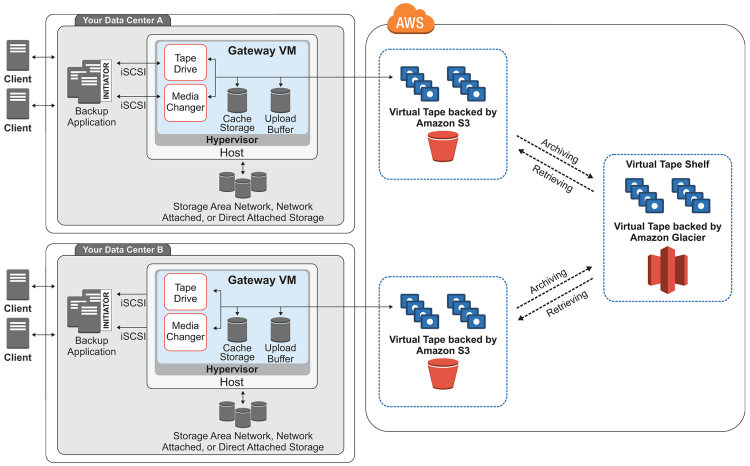 The AWS Storage Gateway service offers a Tape Gateway configuration that gives you an alternative to physical backup tapes that fits seamlessly into your existing backup process. Now you have the local performance of disk, a low-cost highly scalable cloud back-end, and minimal disruption to existing systems. Provision a virtual host with local storage for your Tape Gateway. Create virtual tapes in your gateway's Virtual Tape Library. Virtual tapes are stored in Amazon S3 and available to your backup software through the VTL interface. This replaces tape and tape automation, so you can start using the cloud as a backup target with minimal disruption to existing systems and processes. Back up to these virtual tapes using your existing backup software. The Tape Gateway enables backups to the cloud and preserves your existing software licensing investment, backup jobs, and catalogs. Reduce your costs with long-term archival storage using Amazon Glacier. You can use your backup software to move a virtual tape into Amazon Glacier for further cost reductions. An AWS account: You will need an AWS account to download an AWS Storage Gateway and to create a VTL and virtual tapes. Sign up for AWS. Hypervisor and host: The simplest approach is to run Storage Gateway on-premises as a virtual machine (VM). For more information, see the list of supported Hypervisors and Host requirements. Existing 3rd party backup software to manage the backup jobs and catalog. For more information, see the list of Compatible Third-Party Backup Software. Skill level: Experience with storage and backup technologies, networking, virtualization, backup tools, and tape solutions is recommended, but not required. AWS experience: No working knowledge of Amazon S3 or Amazon Glacier is required. You are charged based on the type and amount of storage you use, the requests you make, and the amount of data transferred out of AWS. There are monthly data storage fees for tapes stored in S3 and for tapes archived in Glacier. To see a breakdown of the services used and their associated costs, see Services Used and Costs. 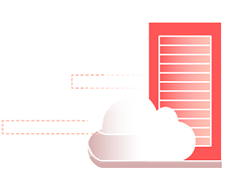 Create seamless storage across your cloud and on-premises environments by working with an AWS partner. Learn more about the multiple ways to manage backup and recovery with the AWS cloud, including using the AWS Storage Gateway. Need more resources to get started moving data into and out of with AWS? Visit the Resource Center to find overviews of complementary services, videos and whitepapers to help you get started with AWS. Learn about the different storage services and features available in the AWS cloud, including usage patterns, performance, durability and availability, scalability and elasticity, security, interfaces, and the cost model.